My Three Answers About Steem on Quora for May 18! Would you like to read my three answers about Steem on Quora for May 18, because this might answer some questions you have about Steem, like witness income, reputation and number of posts shown on the profile? Each month I answer 3 questions in Quora as shown on these 2 posts: How did I get 47.8k answer views with 36 posts on Quora? and My Answers Went Viral on Quora! My Three Answers About Steem on Quora This Month! Quora is a website where more and more questions about Steem are asked, and answering them is a great way to promote Steem to Quora users. 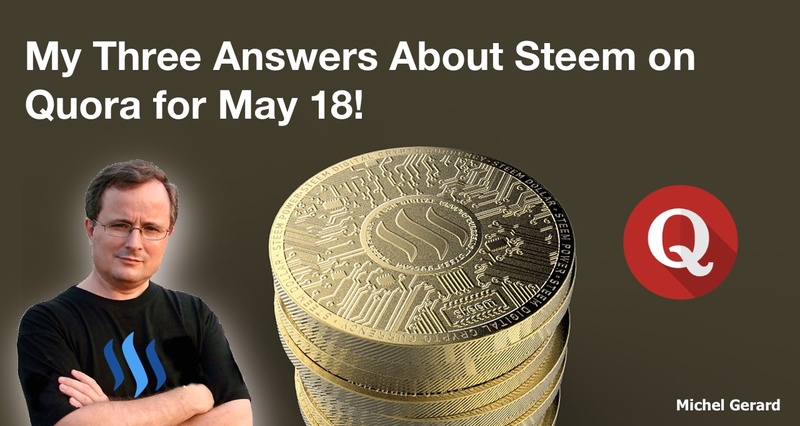 This May, I selected 3 questions about Steem on Quora, which I'd like to share the short answer in this post with you. I selected three Steem questions this month that had none to 3 answers and I hope reading the answers will be helpful for you. You are welcome to click on the links at the end of each section to go to Quora and read the full answer, and we appreciate your upvotes there. 1) How much money could I make if I was one of the top 19 witnesses for Steemit? My answer to this question came from a post by Jerry Banfield, which says it's 250 SP per day. Considering the value of Steem today, this equals to $780 per day. Launch a Steem Witness Today! Finally, this is an interesting video with questions and answers. Ask Me Anything #3 Featuring a Live April 2018 Steem Witness Update with Questions and Answers! Thank you for giving me the chance to serve as one of our top 20 witnesses on Steem as seen at https://steemian.info/witnesses. I intend to be available every week to listen to what you have to say during this live stream on @dlive every Wednesday from approximately 10 am to 11 am EST! If you would like to make a witness vote I recommend to vote for jerrybanfield as a witness as explained at the end of this post, and if you watch the video above you will understand why you should. Would you read and upvote my full answer on Quora because this will help more people discover it? >> How much money could I make if I was one of the top 19 witnesses for Steemit? 2) For Steem, is it the amount of post that someone has created in the picture? If yes, why can't I see all the posts in the blog section? This is a question that a lot of people ask because you often see a big number for "posts" on the profile, but in fact it includes blog posts and comments. If you look at my profile right now, it shows 3,271 posts, which includes 228 posts and the rest are comments. There you can see the real number of blog posts someone has on Steem. Would you read and upvote my full answer on Quora because this will help more people discover it? >> For Steem, is it the amount of post that someone has created in the picture? If yes, why can't I see all the posts in the blog section? 3) How exactly can I reach level 50 in Steem? When you start on Steemit your reputation is 25, so how can you double it and go to 50? I started to answer this question saying, "I think it’s important to know how not to go below 25 because this can be much faster going to 0 than it is going to 50," and I explained that. Now the easy answer to how you can reach a reputation of 50 is to write daily quality posts, you can see more about this on Quora. I included these links from the FAQs on Steemit about reputation. How is the Reputation score measured? How do I improve my reputation score? What causes my reputation score to go down? Why does my reputation score matter? I also included this video, which explains that one post per day is the best frequency on Steemit. Would you join me in hearing about making a blog posting schedule on the best blogging platform as seen at https://steemit.com/@jerrybanfield on Steem because this can be extremely helpful in guiding our creativity in a measured and consistent way? Would you read and upvote my full answer on Quora because this will help more people discover it? >> How exactly can I reach level 50 in Steem? Would you upvote this post and follow me for more because this will encourage me to write more posts like this one? Would you please help @jerrybanfield become a top 10 Witness because you can help funding projects to build Steem as explained here? Vote for jerrybanfield as a witness or set jerrybanfield as a proxy to handle all witness votes at https://steemit.com/~witnesses. Read the 5 reasons why I'm voting for Jerry Banfield as a witness and how to vote in my post. You may be interested to read: What is a Steem Witness, How to Vote and Why? very good post regarding steemit. thanks for sharing,it will help the new users. I am glad you like it. Thank you @mahadihasanzim for commenting. @eco-alex, thank you very much for the upvotes everywhere! Thanks @gmichelbkk for sharing knowledge about witness and reputation. I am working hard to get past 50 rep in coming weeks!! Thank you for your comment @gpalav. You are nearly at 50, just a little more. Qura is place to share knowledge. It is also quite popular all over the world. Your today's post on the reputation for Steemit is another unique post from you. In this post, you have given important information for Steemit lovers. All Steemit members will be benefited from it. Thaks for your great job. Thank you very much for your kind comment @sayemsonai. I am glad this is useful for you. I actually never understood the witness program. But thanks for the info. Thank you @thecapetonian for your comment. It is important to know about witnesses and to vote because without them there is no Steem blockchain. This post has received a 9.14 % upvote from @boomerang.